carton packing ; Size - Weight: 57 x 81 x 68 cm - 43Kg. Wrinkle removal, facelift, skin lift. Safety: Cause it mainly uses RF energy to penetrate hypodermal 15MM, acts on dermis layer, and very low influence on epidermis, collects main energy on target texture, so-called very safe. 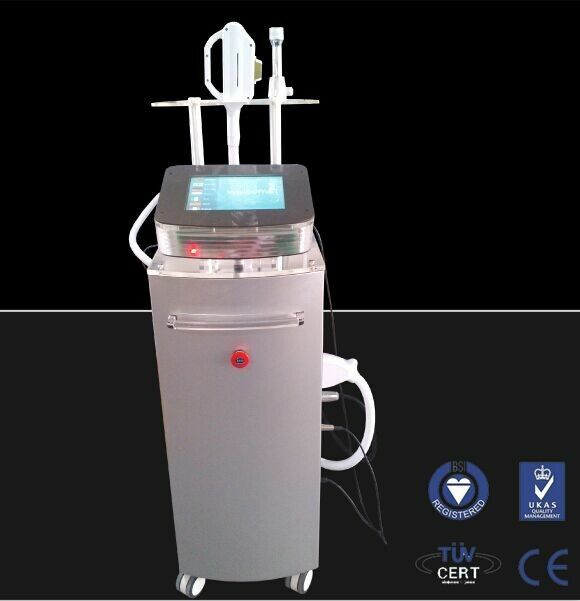 Safety: It simply uses IPL hair removal equipment, very safety on light skin, thick and black hair., but uses IPL and RF together, will also very safety on all colored skin and hair, and more effective on hairs around the lip, golden hair and white hair. E-LIGHT combines good traits of IPL and Radio Frequency, warms up strong pulse, takes bipolar rf to strengthen acting on deep tissue, uses skin can selectively inhale light energy, to induce different impedance between target texture and normal skin. Under the circumstance of low light energy, it strengthens target texture to inhail radio frequency, greatly eliminate side effect like bleb, pigmentation caused by heat action of light energy filtering. E-light can penetrate skin deep, selectively act on hypodermal pigment, blood vessel, dissolve freckle, close abnormal vein, solve skins all kinds of flaws. Simultaneously, E-light can stimulator hypodermal collagen rebirth, make skin youth, health and smooth. Under precondition of precooling, energy will directly push into skin deep, epidermal pigmentation cannot inhail energy, so it can safely act on pigmented skin. Energy can enter15mm under skin. Light energy mainly uses on adjusting target texture impedance, avoid energy echo and reflection problem. Effectively act on any colored pathological changes, like target texture with similar as skin color. Surpass traditional laser and strong pulse therapy, E-light can completely solve many problems like skin rejuvenation, hair removal, acne skin etc. No matter what type of skin or hair color, all can get safe and effective therapy.